(The Echo, Sierra Club, Grand Canyon Chapter’s quarterly paper). I’m deep in a channeled wash for at least the sixtieth time, alone, removing buffelgrass along the concrete berms and anywhere else I find it. It is nasty, difficult and dangerous work, since rattlers are out. I duck under a mesquite, noting its thick, luxuriant growth, put the shovel into the deep soil, and lever out another plant, a thorn nailing my arm again. I will remove between 200 and 300 plants today, bag them, tie the bags, and with great difficulty haul them out of the wash, because there is so little traction on the berms. Dig, bag, tie and haul. Over and over again. Buffelgrass is like Kudzu. It was imported from Africa to Mexico as cattle forage about 70 years ago, and has spread like wildfire. And that’s the literal truth. Buffelgrass grows and burns hot–1500 degrees–and uses the heat to spread seeds. The Sonoran desert is adapted to fire, but not fire that hot, so if buffelgrass crowds a cactus or a mesquite and burns, the native growth dies. I don’t know if we can eradicate it from the entire American Southwest–Sonora is a lost cause–but many of us think we can, and in addition to my adopted wash, I help monthly on another section with other people. I’ve taken out at least 11,000 plants, and as a side benefit, I’m getting a good upper body workout. In one five day stretch, I dug out 1400 plants, using over 120 bags. I gained maybe 50 yards up the wash. Probably less. In the past six months, I’ve worked my way about a quarter mile, slow going, as I hack, bag, tie and haul. But I’m noticing changes. 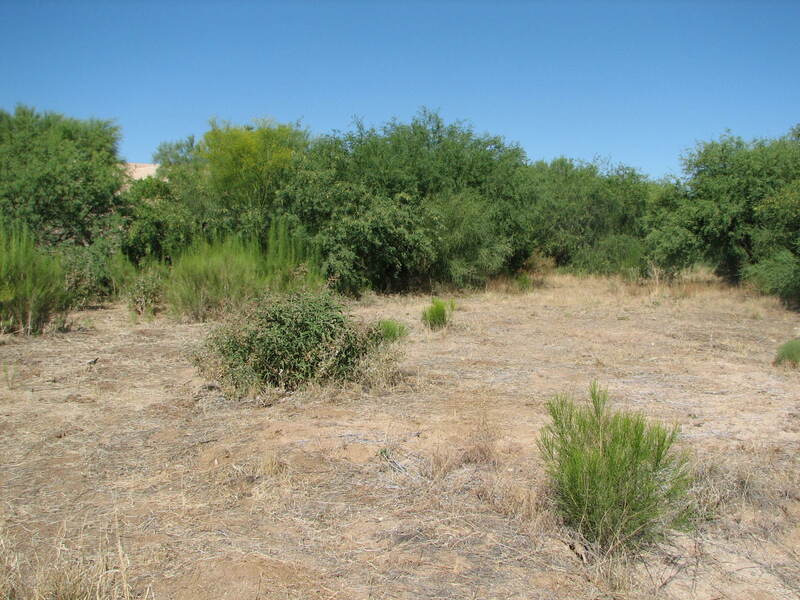 First, if there is no buffelgrass around mesquites, there will be no hot fire if lightning strikes. That will save a tree. Second, I’m noticing native vegetation moving in where the buffelgrass stands once were. We finally got average winter rainfall, and it helped. Third, I am amazed at the deep soil that has washed down from the mountains; there are shade trees, quail, white-crowned sparrows, pyrrhuloxias, and black-tailed gnatcatchers. Lately, the black throated sparrows have arrived. They are difficult to see, but I hear many of them. This wash with its thick growth is a park; an oasis, with condos, roads, and people just above the fence. The above walkway is frequently used by joggers, cyclists and dog walkers, all enjoying the quiet, the green, and the lack of people below them. Maybe it isn’t a greenbelt, but it is a green garter. I could do without the trash; a sign reads a fine of $2500 for littering, but I wonder if anybody has ever been fined for doing it. 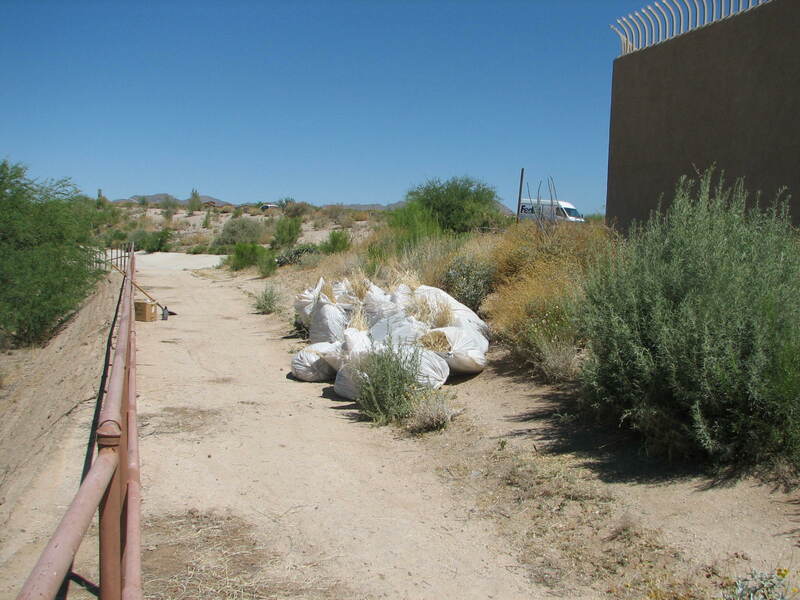 Some of the litter ends up in the trash bags with the buffelgrass. This wash would need a rain we will likely never see again to flow bank to bank. But it does get some water coming off the berms and from the west end of the nearby Catalina Mountains. 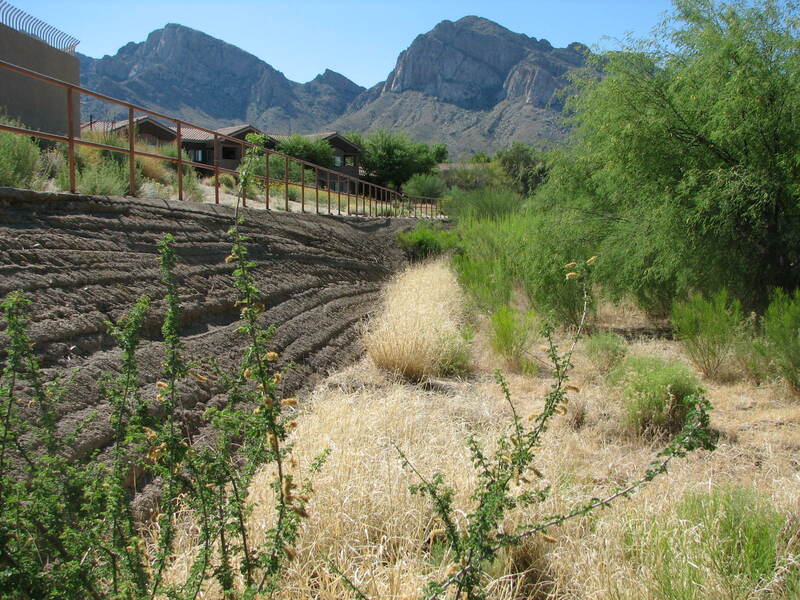 And even in Arizona, it won’t be developed, so if I can remove the invasive buffelgrass, there can be a dense growth of mesquites and palo verdes, good habitat desperately needed; an island of calm in a noisy sea of stucco and steel. We must preserve the major rivers in this state–the Colorado, the Verde, the Salt and the San Pedro. But washes abound, and they are part of the riparian network, too. Visit one some cool morning, before the snakes wake up, and walk where you can. Dress appropriately, because the mesquites are thick. You may find you can’t even go far because of the growth. That’s just great, because the fewer people disturb the area, the more wildlife can live. Never thought I would adopt a wash, clean it up, and enjoy it so much. Never realized how much life was in one. Remember the little guys. This entry was posted on May 31, 2010 at 15:40 and is filed under MY WRITING, OUTDOOR WRITING, PUBLISHED. You can follow any responses to this entry through the RSS 2.0 feed. You can leave a response, or trackback from your own site.